Your audience with thank you after they experience the amazingly funny Comedy in Motion show with Bob Cates. 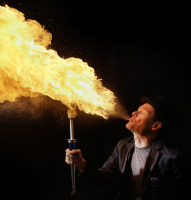 This memorable interactive comedy show includes advanced juggling, wild unicycling and balancing skills, black light laser effects and an insane 21 plate spinning finale that you will remember for a long long time. The Comedy in Motion show is much more than a stand up routine, and involves a great deal of physical skill which has taken years to hone. 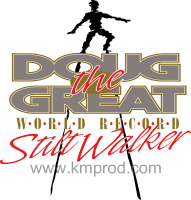 Some skills include advanced juggling, wild unicycling and balancing skills, Dance Dance Revolution while juggling, Chinese Yo Yo and cigar box manipulation, illusion, slapstick and frantic plate spinning reminiscent of the Ed Sullivan Show. 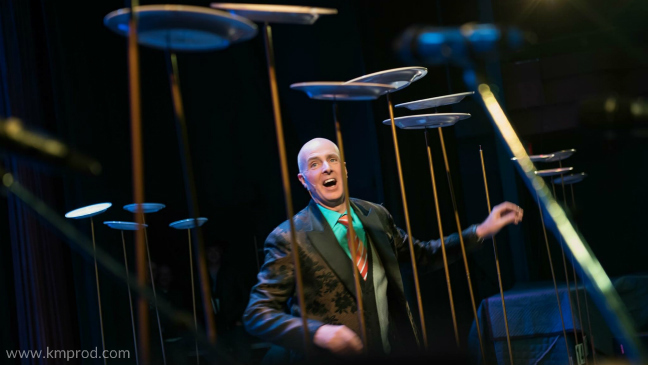 He is one of few performers left in North America performing authentic plate spinning – his signature piece. 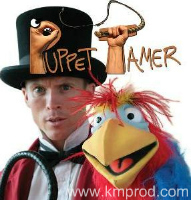 Overall, the show is very fast paced, highly interactive and uses situational comedy and advanced skills to keep audience members of all ages on the edge of their seats right to the very end. Bob, a resident of Cambridge Ontario was twice awarded Best Entertainer of the Year at the Molson Canadian F.E.O. Awards in 1999 & 2001. 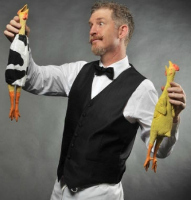 He has also been nominated for Best Entertainer of the Year at the 2007, 2008, 2009 & 2010 Canadian Event Industry Awards and won the Most Difficult Trick Award at the RIT New York Juggling Festival. He has been a special guest performer at the Israeli Juggling Convention and several National Youth Conventions in the United States. When he is not performing as a headliner on luxury cruise ships for Celebrity, Disney or Royal Caribbean cruise lines, he often performs at corporate, association, banquet and gala special events. For more information, fees & booking Bob Cates Comedy in Motion contact us. On behalf of the organizing committee for Cabela's National Sales Meeting, please accept my sincere thanks for entertaining our group at this year's meeting. Your performance was perfect! Between your jokes, juggling, lights, music and plate spinning, you kept the crowd of 500 employees captivated for the entire evening. In our conference-ending survey, your performance received 100% positive reviews from our employees, which is a testament to your talent, skill and ability to interact and connect with such a large crowd. I wanted to express Home Hardware's appreciation for the great entertainment you put on for our Dealer Conference. You were hilarious and provided laughs for an audience composed of both adults and a few kids. I heard many, many comments from others that enjoyed your show as much as I did. Thank you. Bob performed for approximately 2000 people during the weekend and each show had the same "magic". The goal of our Christmas show is to provide a high calibre special event for our employees, and Bob certainly helped us achieve our goal. We were totally amazed. I would highly recommend Comedy in Motion with Bob Cates if you're looking for a professional, innovative, and amazing show, which will engage everyone! I have to admit I was a bit skeptical when I'd heard that we had booked a "juggler." Then I sat back and watched in amazement as he interacted and entertained the audience. Let me tell you from past experience, that sometimes it can be difficult to please some of these people. But they just sat in awe and watched in amazement. Everyone thoroughly enjoyed the show. The show was a complete success every week! The turn-outs as well as subsequent comments were phenomenal. Your outstanding personality and ability to work with the resort's clientele (people of all ages) are second to none. Your willingness to do the best job possible and go above and beyond the call of duty is unparalleled and has definitely left a lasting impression with everyone you have ever come in contact with here at this resort. Bob has certainly mastered his craft as an entertainer. His moves are well rehearsed; the timing of his jokes is impeccable. He responds to television cameras like a pro, and covers himself well in any situation that he finds himself in (and he's really funny!) 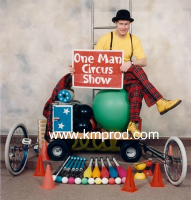 Bob is extremely skilled and fascinating to watch ... whether he is warming up, juggling knives, unicycling, working with the diabolo, or kibitzing with the audience. He keeps things upbeat, uses music to his advantage, and keeps things very well paced. I particularly enjoy that when Bob works with audience members, there are no put downs, or any embarrassing remarks directed at that person.